Our cartoon for today follows up on last week’s one, where Red of Red and Rover has stepped on a bee. This cartoon appeared on August 4, 2004. Would you say that going barefoot brings out the poetry in us? Today’s comic again visits Red and Rover, a strip based in the 1960s when a lot of kids still went barefoot for the summer. This strip is from August 3rd of 2004. It uses another staple of going barefoot in the comics: the dreaded “stepping on a bee”. Actually, I don’t think stepping on a bee would bother me—my soles are thick enough that I don’t think the stinger would penetrate far enough. And for poor Red up there, by August I would think a long summer of going barefoot would have protected him, too. Here’s another comic from the old strip Grandma. I’ve noted before that the strip seems to have a bit of a negative take on bare feet. That’s much more obvious in this one, published on April 5, 1957. Here’s a strip from the comic Pickles. It’s drawn by Brian Crane and features a retired couple, and thus often addresses issues of getting older. But not always. 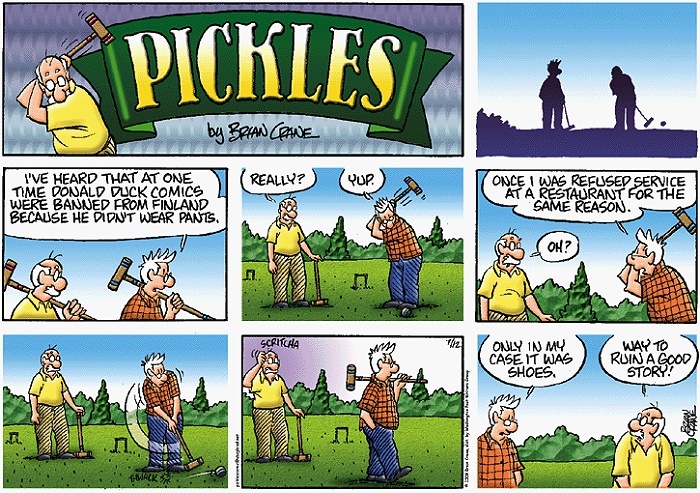 This strip was published on July 12, 2009 and has a slightly different look at the NSNSNS issue.